On 1 February 1492, the prominent humanist and lawyer Stefano Infessura (c.1435-1500) wrote in his Diary of the City of Rome: “That day there was a miracle in the city”. During reconstruction works at the prominent basilica of Santa Croce in Gerusalemme, inside a small hollow in the roof, a leaden box was discovered. A marble plaque on top of the box had the inscription HIC EST TITULUS VERAE CRUCIS carved into it: “this is the title of the true cross”. At the time, this was a major event, because this Titulus Crucis was believed to be the small piece of wood that had stood at the very top of Christ’s cross, often represented with the abbreviation I.N.R.I. [Ihesus Nazarenus Rex Iudeorum (John 19:19-22)] in medieval iconography of the Crucifixion. Rome was abuzz with stories about the discovery of this very important Passion relic, and Stefano Infessura was certainly not the only author to comment on the event. We have three more reports by contemporaries, Johannes Burckhard, Leonardo Sarzana, and Sigismondo dei Conti, who all give slightly different versions of the same event. When we compare the accounts of this remarkable occurrence, it is possible to notice some intriguing variations in these authors’ descriptions of how, when, and where the relic was discovered, as well as what its container looked like. For example, Johannes Burckhard agrees the leaden container was discovered in the roof of the basilica of Santa Croce, but describes it as wrapped with a cord secured with three seals marked with the words GERARDUS CARDINALIS S. CRUCIS, and TITULUS CRUCIS written on a side of the box. Leonardo Sarzana instead says that the box was impressed with the letters ECCE LIGNUM CRUCIS, “behold the wood of the cross”, while Sigismondo dei Conti records the event of the discovery one day earlier than Infessura, on the last day of January 1492. Early modern engraving of the Titulus Crucis relic at Santa Croce in La Trionfante Croce (1610) by Giacomo Bosio (Image digitized by Google). So, what really happened? From a modern perspective, the ‘miraculous’ discovery of an apparently highly prized relic that could somehow lay hidden and forgotten at a prominent church for centuries may seem rather hard to believe. Yet we should be careful with condemning the fifteenth-century citizens of Rome, some of whom were highly educated – including our four reporters –, as particularly gullible or unquestioning. So what made this discovery a believable story back then? By asking these two questions, we can begin to reconstruct the actual course of events in 1492, and at the same time shed some light on the seemingly recent phenomenon of fake news. Nowadays, the spread of fake news involves the mechanisms and algorithms of digital social media, but we should not underestimate the impact of mouth-to-mouth reports travelling fast in fifteenth-century Rome, and we can certainly still learn something from the discovery of the Titulus relic. It can help to elucidate how stories or ‘news items’ that are actually untrue, can come to be quite generally accepted as true. In the case of the Titulus Crucis, the ‘occurrence’ of this miraculous event had everything to do with international politics, and its acceptance as ‘true’ with a pre-existing web of stories linked to the location of Santa Croce. Quite surprisingly, there had been a number of hints at the Titulus Crucis being present at the church of Santa Croce well before its miraculous discovery early in 1492. The popular late medieval text Indulgences of the Churches of Rome was a guidebook aimed at pilgrims travelling to Rome. It circulated widely during the late fourteenth and fifteenth century in several versions in both Latin and the European vernaculars. A few manuscript redactions of this text briefly mention the Titulus as being present at Santa Croce, while it is not included in the official record of the relics kept there at the time. 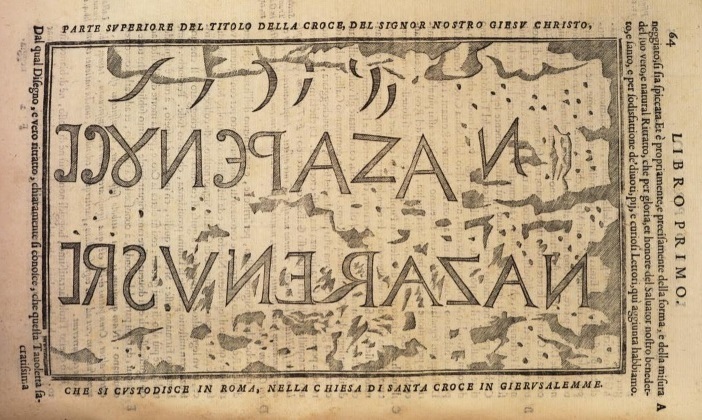 Most likely inspired by one of these redactions of the Indulgences, the Nurnberg patrician Nikolaus Muffel wrote in his travel account that he saw the “superscript of the holy cross, which says: Jhesus Nazarenus rex Judaeorum” at Santa Croce when he was in Rome in 1452. This is forty years before the miraculous discovery that attracted so much attention! Based on this information we may suspect that the 1492 ‘miracle’ was somehow staged. In addition, it also suggests that these pre-existing, shattered stories about the Titulus being present at Santa Croce enabled staging a miraculous discovery. When something is already vaguely suspected, it is always easier to believe when it is confirmed. These rumours provided a fertile matrix of ‘historical’ precedent that helped contemporary audiences to contextualize and believe the news. The same can also be observed today. For example, when Donald Trump referred to a non-existent terrorist attack in Sweden in a political campaigning speech in February 2017, he made it sound believable by referring to previous attacks in Nice and Paris that actually happened, and by invoking widely felt concerns about immigration. This piece of fake news for political ends failed to be widely accepted because nothing had happened in Sweden, notwithstanding subsequent attempts to connect it to slightly later events in Sweden. But what if something that could have been convincingly connected with Trump’s suggestion had happened? Coloured woodcut representing the church Santa Croce in Gerusalemme in Anon. Van die seuen kercken van Romen ende vanden aflaten diemen daer in verdienen mach (printed late fifteenth, early sixteenth century). Early February 1492 something did certainly happen in Rome; the question only remains who could have staged the discovery of the Titulus and why? The written reports about the event provide some first clues. On 2 January 1492 the last stronghold of Moorish Spain had fallen to the combined Spanish forces of Aragon and Castile. The news reached Rome one month later and three out of four reports connect the discovery of the Titulus with the victory at Granada. For example, Sigismondo dei Conti first chronicles the news of this victory at the beginning of February, and then notes that the Titulus was actually found the day before, explicitly connecting the two events. The sources also show awareness that the titular Cardinal of Santa Croce, Pedro Gonzáles de Mendoza (1422-1499), was the patron of the then ongoing reconstruction works at the basilica. Mendoza was also an active participant in the Granada wars and maintained close ties with the Spanish Crown. The ‘discovery’ of the Titulus relic was most likely presented at this moment because this would add further sparkle to the news of the Spanish victory reaching Rome. Although it might seem counterintuitive to our modern eyes, the connection with Spanish patronage and the victory at Granada made the discovery of the relic seem more believable rather than less: this was a very suitable moment for it to be discovered! Moreover, Santa Croce in Gerusalemme was also a very suitable place for the relic to turn up. The basilica had been called Santa Croce, holy cross, on account of an ancient cross relic, long since lost, that was probably installed in this church by the first Christian Emperor Constantine I (272-337 CE), who also founded the church. Based on as of yet unclarified new developments in the legend of St Helena (c. 250-330, Constantine’s mother) during the late fifteenth century, Stefano Infessura observed in his Diary that it was generally supposed that St Helena placed the Titulus there. Ferdinand II of Aragon and Isabella I of Castile, whose marriage in 1469 first created a unified Spain, may have in fact regarded association with the imperial figures of Constantine and Helena as a very pleasing collateral effect of the discovery of the Titulus, apart from promoting the news of their victory at Granada. In sum, the miraculous discovery of the Titulus Crucis was successful as political propaganda because it tapped into a pre-existing network of stories, both old and new, thereby creating a new story that was believable only because of its firm foundation in established narratives. Fake news only survives in excellent conditions, with the help of countless circumstantial stories. The news of the rediscovery of the Titulus has indeed weathered the centuries, despite challenges in the early modern period and even a recent carbon dating of its wood (it is old, but not that old). After all, it’s the stories that count, not always the facts, as we can still witness today. 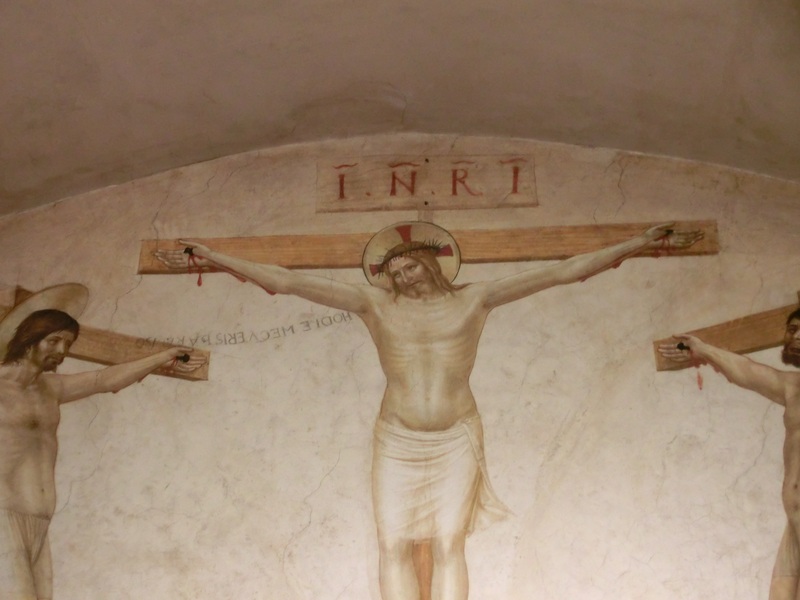 Crucifixion by the artist and Dominican friar Fra Angelico (c. 1395-1455) displaying the Titulus Crucis marked with I.N.R.I. at the San Marco convent in Florence, c. 1440s (Photo: Marianne Ritsema van Eck). Francesco Bella and Carlo Azzi, “14C Dating of the Titulus Crucis,” Radiocarbon 44, no. 3 (2002): 685-689. Sible de Blaauw, “Jerusalem in Rome and the Cult of the Cross,” Pratum Romanum. Richard Krautheimer zum 100. Geburtstag, ed. Renate L. Colella et al., 55-73. Wiesbaden: Reichert, 1997. Jan Willem Drijvers, “Helena Augusta, the Cross and the Myth: Some New reflections,” in Millenium Jahrbuch 8 (2011): 125-174. Felipe Pereda, “Pedro González de Mendoza, de Toledo a Roma. El Patronazgo de Santa Croce in Gerusalemme: Entre la Arqueología y la Filología,” Histoire et Littérature de l'Europe du Nord-Ouest 40 (2012): 217-243. Anna Pontani, “Note sull’Esegesi e l’Iconographia del Titulus Crucis,” Aevum 77, no. 1 (2003): 137-186. 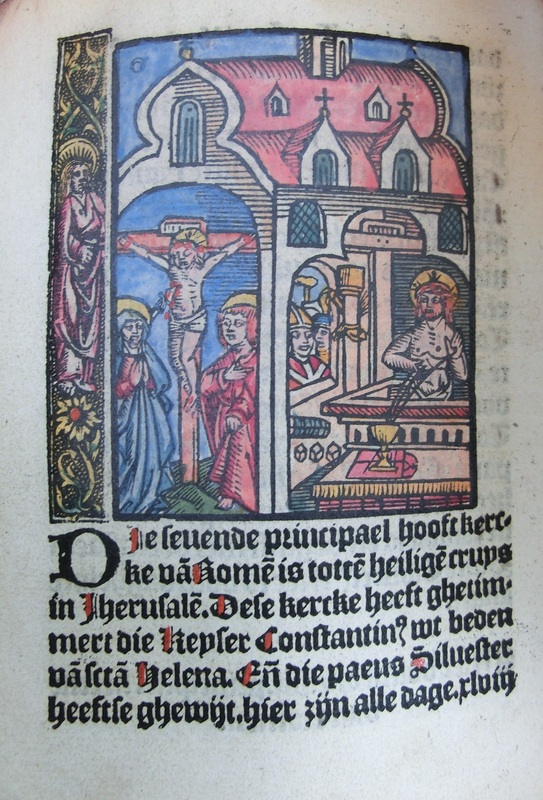 Johannes Röll, “Bemerkungen zum Titulus Crucis in Santa Croce in Gerusalemme in Rom,” Die Virtus in Kunst und Kunsttheorie de italienische Renaissance, ed. Thomas Weigl, Britta Kusch-Arnhold, und Candida Syndikus (Münster: Rhema, 2014), 93-110. © Marianne Ritsema van Eck and Leiden Medievalists Blog, 2018. Unauthorised use and/or duplication of this material without express and written permission from this site’s author and/or owner is strictly prohibited. Excerpts and links may be used, provided that full and clear credit is given to Johannes Müller and Leiden Medievalists Blog with appropriate and specific direction to the original content.